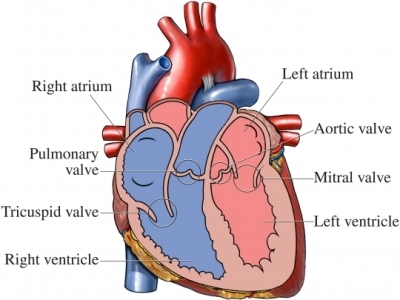 Contrast echocardiogram—A solution is injected into the vein and can be seen in the heart. Stress echocardiogram—This records the heart's activity during a cardiac stress test . Echocardiogram with Doppler ultrasound—This helps your doctor assess blood flow. Transesophageal echocardiogram can provide clear images of the heart. A tube with an ultrasound device at the end is put down your throat into esophagus. Your doctor may need to use this test depending on what part of the heart needs to be viewed. May be needed instead of standard echocardiogram for people with certain lung diseases or obesity . A gel is put on your chest. This gel helps the sound waves travel. A small, hand-held device called a transducer is pressed against your skin. The transducer sends sound waves toward your heart. The sound waves are then reflected back to the device. The waves are converted into electrical impulses. These impulses become an image on the screen. Still images or videotape moving images can be captured. To get clearer and more complete images, the transducer may be moved to different areas of your chest. You may be asked to change positions and slowly inhale, exhale, or hold your breath. The gel is wiped from your chest. The images are analyzed. Based on the findings, your doctor may recommend treatment or further testing. After the test, call your doctor if you have worsening heart-related symptoms. Echocardiogram. American Heart Association website. Available at: http://www.heart.org/HEARTORG/Conditions/HeartAttack/DiagnosingaHeartAttack/Echocardiogram---Echo%5FUCM%5F451485%5FArticle.jsp#.Wphg12rwZQI. Updated October 13, 2017. Accessed March 1, 2018. Echocardiography. National Heart, Lung, and Blood Institute website. Available at: https://www.nhlbi.nih.gov/health-topics/echocardiography. Accessed March 1, 2018. General ultrasound. Radiology Info—Radiologic Society of North America website. Available at: https://www.radiologyinfo.org/en/info.cfm?PG=genus. Updated May 30, 2016. Accessed March 1, 2018. Transoesophageal echocardiography (TEE). American Heart Association website. Available at: http://www.heart.org/HEARTORG/Conditions/HeartAttack/SymptomsDiagnosisofHeartAttack/Transesophageal-Echocardiography-TEE%5FUCM%5F441655%5FArticle.jsp#.WphfzGrwZQI. Updated October 13, 2017. Accessed March 1, 2018.